Your Business Needs 100% Uptime. 24-Hour Remote Monitoring and Management Will Save Your Business From Lost Revenue Due To Downtime. 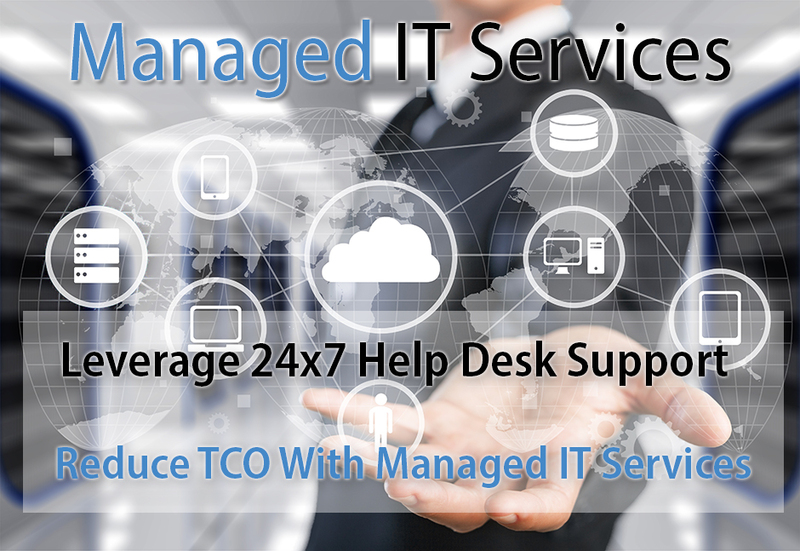 Save Time & Money With Managed IT Services. Prevent Outages, Service Disruptions and Downtime! Let Us Show You How We Can Save You Money Today. Because Your Business Needs To Take Competitive Advantage By Increasing Productivity, Streamlining Processes And Optimizing Performance. Time is Money! Managed IT Services Saves You Time And Money! Our Managed IT Services Provides 24-Hour Remote Monitoring, Management And Automation For Your Business. Free Up Your Time So You Can Focus On Managing Your Business! Get Managed IT Services Today! Business owners find themselves wasting valuable time trying to maintain their Information Technology infrastructure needs, instead of using that time to strengthen their business, generate growth, maximize profits and reduce risk. They’ve got enough to do simply trying to run their business. They shouldn’t have to worry about managing data, internet and other key services. It is imperative that businesses leverage the power of today’s state-of-the-art Information Technology techniques to help their business prosper and keep up with competition. Managed IT Services help achieve this for small businesses and organizations of any size that are limited by time, energy and resources that get redirected to other activities that don’t produce a competitive advantage or contribute to growth of your business. Small Businesses with no budget for full-time IT support staff to manage their Information technology needs tend to sacrifice efficiency in an effort to control or reduce costs. When your IT systems are the heartbeat of your business operations, there’s no room for error or cutting costs. Downtime, Data Loss, Disaster and Security breaches can cripple your business. Managed IT Services let you focus on driving your business forward while we take care of your day-to-day IT technology needs, without the huge overhead. Your Business Needs High Availability When Disaster Strikes. DRaaS Is The Most Effective Strategy To Protect Your Business From Fire, Storm, Flood, Hurricanes Or Power Outages! Increase Employee Productivity With Safe, Secure, Simple Remote Access To Your Computer, Applications, Data and Network resources. From Anywhere, at Anytime. Protect Your Business And Computer Systems From Emerging Threats, Viruses, Spyware and Malware With Industry-Leading Antivirus, Antispyware, Firewall, Intrusion and Threat Protection. Communicate With Your Customers, Manage Your Sales and Grow Your Business. Smart Businesses Let Our Experts Manage Communications With Their Vendors. We Speak Their Language, So You Can Run Your Business Successfully. Managed IT Service Plans Offer Robust Options For Businesses That Need Comprehensive IT Support, But Don’t Have The Time, Skill Set Or IT Support Staff. We Are The IT Department Your Business Needs. Let Us Help Manage Your IT Needs. With The Computer Pros of America and 20 years’ experience as a Managed IT Service Provider, you can rest assure that we will always be there to support your business needs and ensure that your IT network and infrastructure are running at optimal performance. We will make sure that your Suffolk or Nassau County, NY business improves IT workflow and minimizes downtime, to keep your customers and employees satisfied and company moving ahead. The Computer Pros of America’s Managed IT Services will help your Long Island, NY business minimize costs, increase productivity and efficiency that will allow your business to grow and prosper. As your Managed IT Services partner, The Computer Pros of America ensures that you’ll get all the expertise you need so that you can focus on your core business. Our managed IT computer services plans are fully customizable and tailored to suit your budget and your needs. The Computer Pros offers a wide range of additional technology solutions and services from Backup Disaster Recovery to remote support and network management for your small business needs on Long Island, NY. Are you tired of making frequent service calls to your Helpdesk or IT Solutions Provider? Is downtime a common occurrence due to technical issues? Does your business need your computer systems and network infrastructure to be more reliable and stable? Are you looking to reduce IT costs and save money for your business? Using Remote Monitoring and Management tools will help minimize service requests, reduce downtime and provide proactive problem resolutions with optimal performance for your computer systems. All of this on a predictable, low monthly rate. The Computer Pros offers 24x7x365 Remote Monitoring and Management for your entire organization’s computer systems, network infrastructure and Internet Connection. Our remote monitoring agents will detect issues before they become a problem and instantly alert our Technical Support Center by creating a service request helpdesk ticket for our Service Desk Team. Our expert technicians will immediately begin problem resolution. This helps to increase operational efficiency and uptime for your business and prevent potential lost revenue by maintaining a high level of uptime. Your computer has an error on the screen and you need it solved quickly. You need to upgrade your computer systems after-hours, but don’t have the time to stay late. You don’t want to pay expensive rates and travel time for an on-site service request that can be solved in minutes. You need a professional IT company that uses the best practices for remote control support to help fix error messages and problems quickly. Unattended remote control support allows for after-hours access to your computer system to perform off-hours tasks, upgrades and problem resolution. Reduce support costs and stop paying high rates for on-site service when the issue can be solved remotely in minutes. With The Computer Pros Remote Control Support, we can connect to your computer before you finish explaining what the problem is. We deliver live remote technical support anywhere you are, in a timely fashion, never charging for expensive on-site service and travel time. With Unattended access, our Remote Control support allows our certified professional technicians remote control access to upgrade your computer systems and perform routine maintenance even when your staff is not in the office. Your computer needs Windows security patches installed, but you don’t have time to visit each computer and check to see what had been installed. You uncertain whether all of your computer systems have the latest security patches installed company wide. New Vulnerabilities are being discovered almost every day, you just can’t keep up with manually installing Windows patches. You need a company-wide patch management system that automatically checks and deploys Windows security patches and fixes. You need a patch management system that reports the success and failures of patch installation. Having a patch management system that can be scheduled to check for new patches and deploy the patches immediately is a best practice. The Computer Pros provides complete Automated Patch Management solutions which ensures that all the latest patches are installed to all your computer systems. Our patch management system provides exhaustive reports on computer system patch deployment status. We schedule multiple daily checks throughout the day for new available patches that need to be deployed and schedule the deployment for the appropriate time. What changed? When did it change? Who Changed It? Why Was It Changed? Assests and inventory are constantly changing. You’re a business owner and had no idea that unauthorized or undesirable programs were being distributed to your computer systems. Configuration change to your network could cause errors and issues that are difficult to troubleshoot and resolve. Auditing and maintaining accurate inventory of all your assets is time consuming and resource intensive. You need to automate your asset inventory management so you can focus on running your business and less time doing manual inventory and updating of your reports to reflect accurate information. You need to know who is making changes to your computer system and when they made those changes. Automated Auditing and Inventory management will collect changes to your business systems so you can have current detailed information for trend analysis on changes to your computing environment. The Computer Pros of America deploys integrated business process automation systems for auditing, asset and inventory management with schedule reporting so you can have current information at your fingertips. We provide your business with monthly audit and asset reports including software, security patches, hotfixes as well as hardware specifications. As your business grows, so does your exposure to spyware, adware, viruses and threats lurking out on the internet waiting to destroy your business. For a Small Business, threats such as a virus attack, can mean the difference between success and failure of your business. Without a top-rated endpoint antivirus protection system that is both proactive and thorough, your company may fall victim, losing critical business information, productivity, revenue and customers. Your organization needs a proven strategy, robust tools and the expertise to defend against today’s growing virus, spyware and threats. The Computer Pros of America meets the needs of your small business by protecting your business and every desktop, laptop and server with our Industry-leading, easy-to-use, cloud-managed, Hosted Antivirus Solution. With no additional hardware costs, our Hosted Antivirus Solution sets up in minutes. Small businesses can now get large enterprise protection without the need for large teams of IT staff to implement and administer. With simple, affordable monthly subscription pricing, you can control operating costs and forecast future expenses. Our cloud managed, endpoint protection solution offers the scalability to address the needs of your growing business over time by allowing you to only pay for what you use. You are getting a network error when trying to connect to your server? Your internet is real slow and you cannot get your email in a timely fashion. Running daily reports caused the entire network to get slow and the staff is complaining that they cannot do their job efficiently. Uptime and performance is mission critical for your organization’s bottom line. Your servers and network deliver access to programs, files and internet resources. If your network and servers slow down, get errors or fail, your network systems can go down. You need to know when there is a network performance issue immediately, before it causes more damage, like file and database corruption. You need to monitor your network and systems for performance issues before they cause your business financial losses. The Computer Pros Managed IT Services provides network performance monitoring of your critical network and computer systems, 24-hours a day, with proactive automated troubleshooting steps to help resolve issues or alert, so that steps can be taken to resolve the issue immediately.